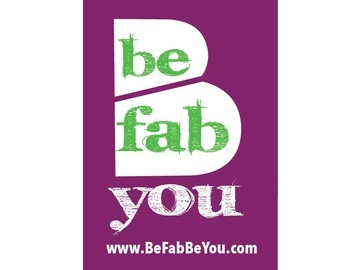 Kim Dildy 4 Great Speakers, 15 Awesome Vendors from Beauty to Brains, from Education to Insurance, Raffles every hour and Opportunity to network with men and women from diverse industries and background. Only thing missing is YOU! 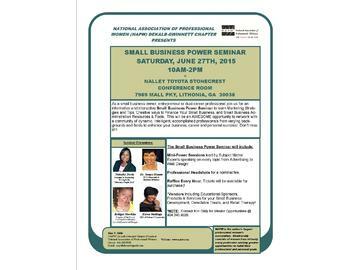 Plan to be at the NAPW DeKalb-Gwinnett Small Business POWER Seminar this Saturday, June 27th from 10AM - 2PM. 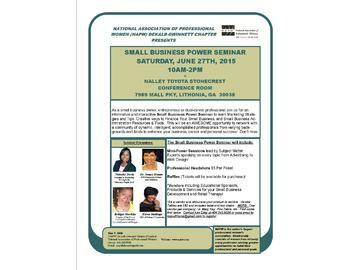 See details at www.napwdekalbgwinnett-june.eventbrite.com. 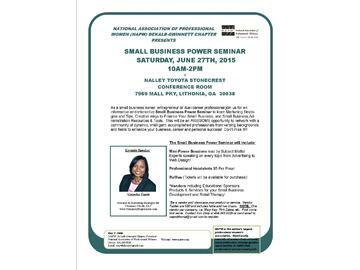 Kim Dildy Mark your calendars for Saturday, June 27th, Small Business POWER Seminar, from 10AM-2PM, at Nalley Toyota Stonecrest! Free & Open to the Public. Vendor Opportunities Available for $50 per table. Industries Leaders delivering key business topics, professional headshots $5 per pose, raffles & prizes, double exposure for vendors with Nalley's Vendor Showcase same day and much much more! 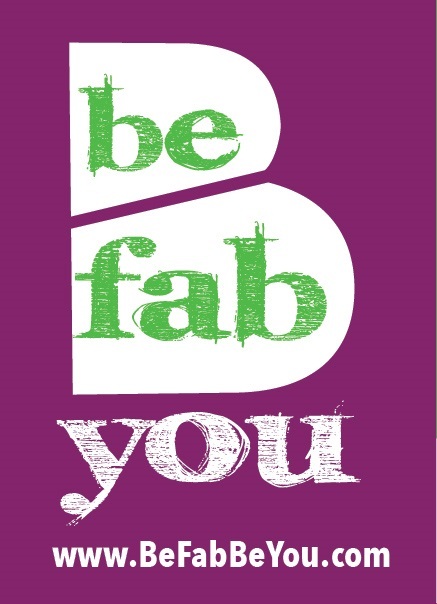 Great opportunity for all to enhance your business, career & personal success! Don't miss it!!! 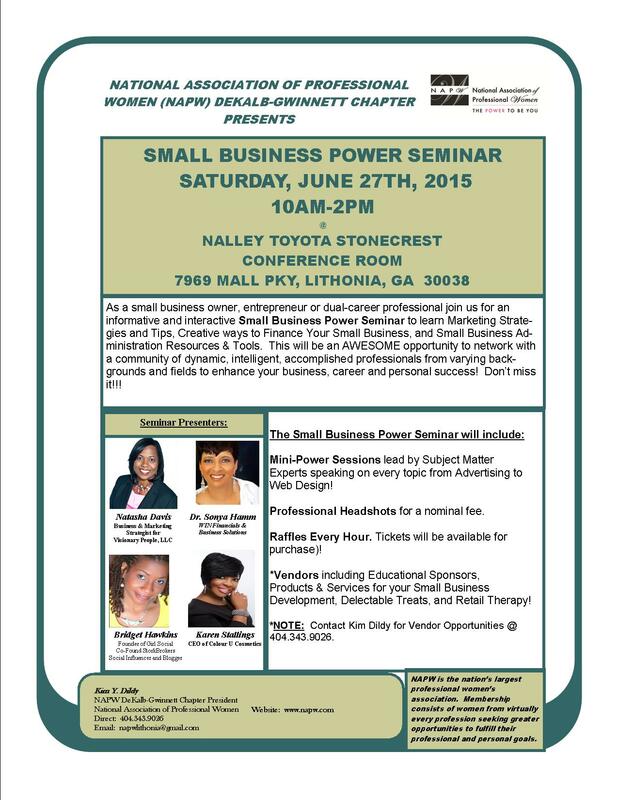 RSVP www.napwdekalbgwinnett-june.eventbrite.com. For Vendor sign up contact Kim Dildy @ 678-587-3589. Kim Dildy Are you a woman small business owner (WBO), or entrepreneur? Why not join in the celebration recognizing all small business owners in America, during National Small Business Week? You are invited to join a select group of women who are working daily to grow small businesses, create jobs, drive innovation, and increase America's global competitiveness. IXGEN with support from the SBA Women in Small Business Program, has put together a workshop to help you become more competitive in the US marketplace! Come and learn about women-owned certification, how you can grow your business through winning contracts, the legal aspects of being a private contractor, and much more! 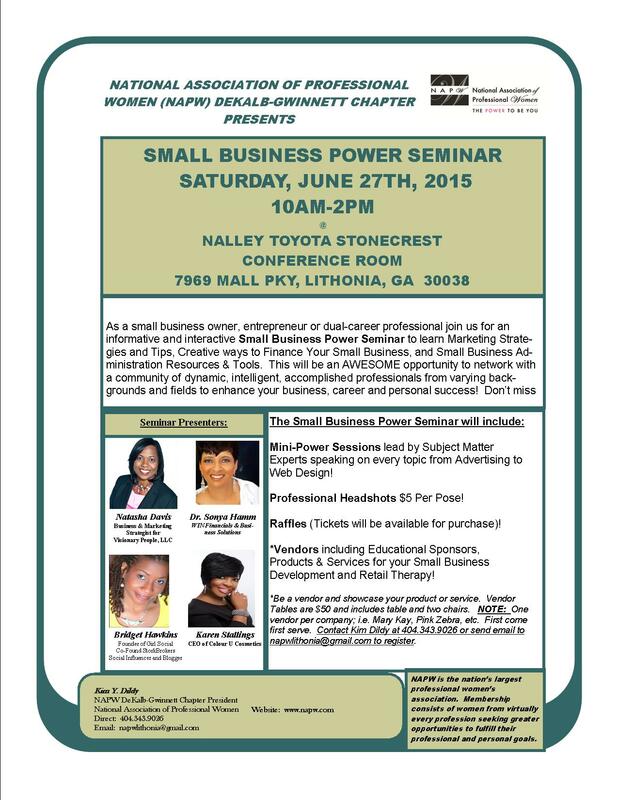 The workshop will be held at the prestigious Nalley Toyota Dealership, in Stonecrest, Lithonia! YOU DO NOT WANT TO MISS THIS OPPORTUNITY! REGISTER NOW TO ATTEND THE WORKSHOP! ATTENDANCE IS FREE, BUT A DONATION GETS YOU LUNCH! REGISTER NOW!​ http://tinyurl.com/o2okzyl Share with other WBOs. To attend the workshop is free, but we welcome a donation if you want to add lunch! 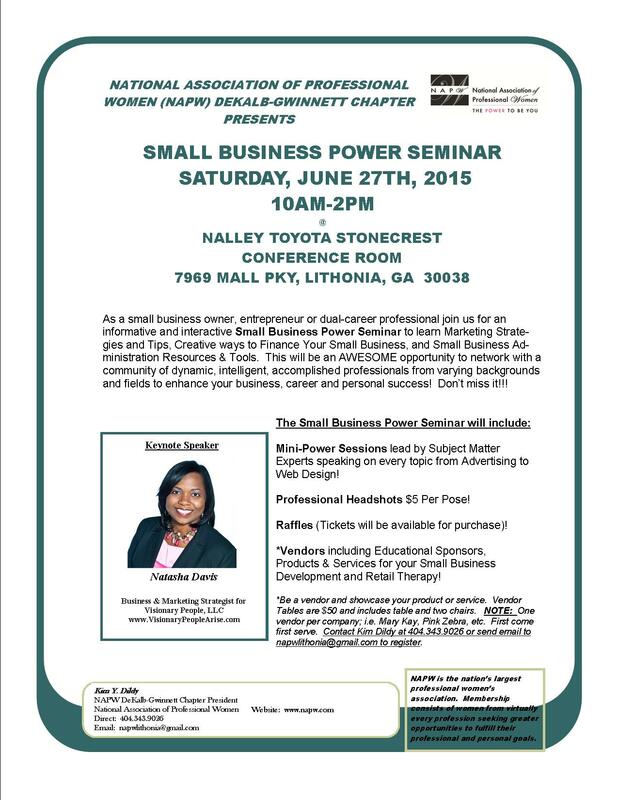 Please come with lots of business cards and information to share about your business! 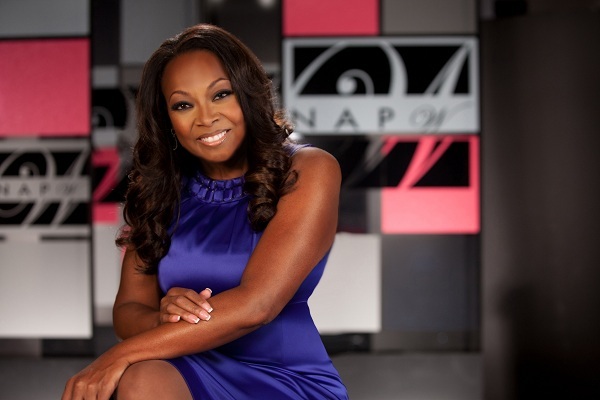 Emmenette D. Mason, MBA Founder/CEO IXGEN Inc. P.O. Box 1442, Lithonia, GA 30058 Office: (770) 708-7374 Mobile: (404) 348-6699 Fax: (530) 658-542802 http://www.ixgeninc.org http://www.linkedin.com/home https://www.facebook.com/ixgeninc http://www.youtube.com/user/IXGENInc http://www.twitter.com/ixoyeglobal "Promoting a Global Perspective for Micro Entrepreneurs in the USA and Africa"
Alyssa Ramos Great page!!! Keep up the great work! Kim Dildy SAVE THE DATE: Monday, September 21st, 2015 - Professional Diversity Career Fair & PNE, Crowne Plaza Perimeter at Ravina, Atlanta, GA, 12-6PM & PNE Event 6-8PM.